The 2015 Lake Superior Performance Rally will go down in history as the event where David Higgins and Craig Drew made a clean sweep of the Rally America National Championship, to become the first team to claim a perfect season in 28 years. The momentous achievement did not come easy for Subaru Rally Team USA. There were several operational delays throughout the day, which added an extra level of stress for drivers who have to wait indefinitely for stages to begin while remaining mentally prepared. 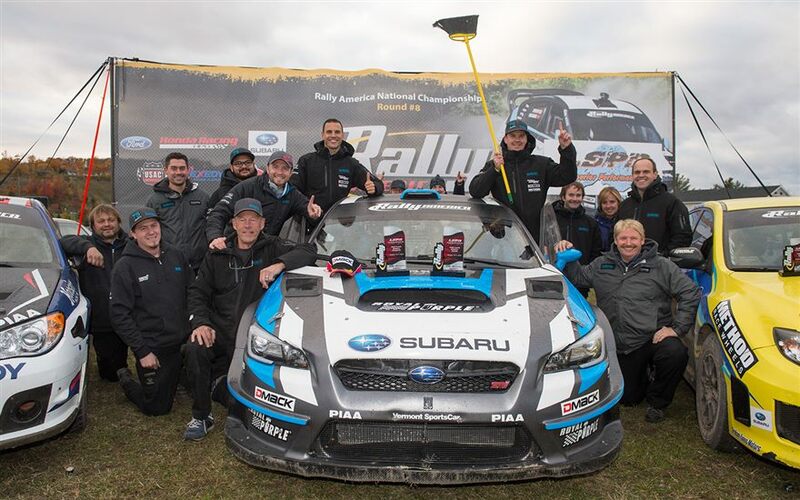 The pressure on David Higgins and Craig Drew was further elevated by the enormous expectation put on them to win, from the thousands of spectators to fellow drivers, all eyes were on the Subaru team to not make a single mistake this weekend. Like any true professional, David Higgins and Craig Drew did not crack under pressure and delivered as expected. When reflecting back on the past two days, David remarked "It was a hell of a long weekend. It is amazing to do what we have done, but you can only do it with a great team like we have. Craig has been awesome as always and we have been on a good winning streak for a long time, but this win was special. Stages were in good condition and for us the big task was to bring it home. Great job by the team and I'm proud we matched John Buffum's record." SRT USA Team Manager, and the last driver to claim a perfect season, John Buffum added, "It is definitely difficult to achieve a perfect season, obviously it has not been done for a long time. It takes not only a skilled driver and navigator, but also a reliable car. The 2015 Subaru WRX STI was a key piece in what helped David and Craig reach this success. Most of all, it takes a great team. All of those things came together for David and Craig this year and it is cool to see and be part of it. It was exciting for all of us on Subaru Rally Team USA." Congratulations to David Higgins and Craig Drew as well as everyone on the SRT USA crew that made this tremendous achievement possible!